Compliance and ethics play a critical role to assure the integrity of the organization to its values and obligations. Every organization should integrate information, processes, and systems to deliver metrics that support the ability of the business to achieve objectives while addressing uncertainty and acting with integrity. Measuring and analyzing compliance and ethics efforts not only ensures a well-run capability but also delivers essential information for strategic and operational decision-making. 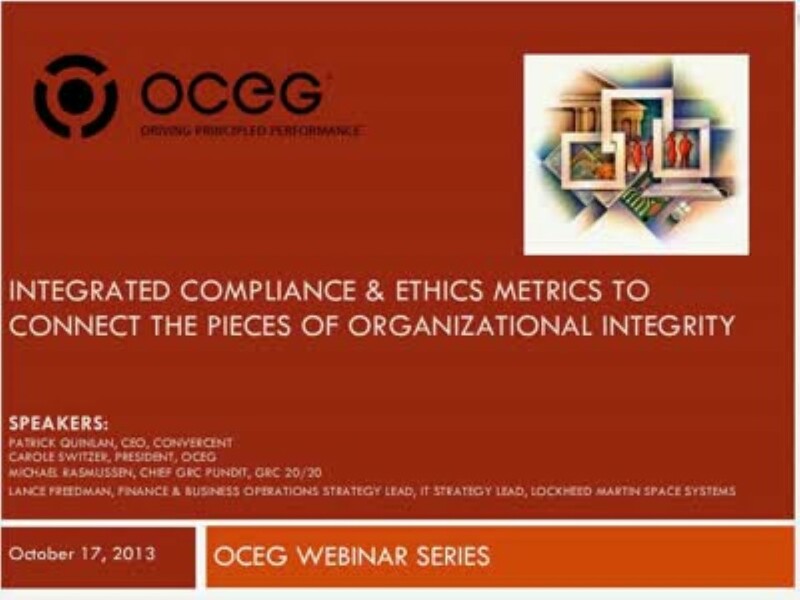 In this webinar we will explore how an integrated system of measurement and analysis provides a clear picture of compliance and ethics capability throughout the enterprise and supports organizational integrity. Join Convercent CEO Patrick Quinlan, OCEG President Carole Switzer, GRC 20/20 Chief GRC Pundit Michael Rasmussen, and Lance Freedman, Finance & Business Operations Strategy Lead, IT Strategy Lead, Lockheed Martin Space Systems as we discuss best practices for implementing and maintaining an effective approach to measuring compliance and ethics in the context of the organization.